Once you've approved your design, the layout is blown-up to the actual barrel head size. It's then converted to digitized line art, printed on paper, tiled and transferred to the wood surface in a 'blueprint' line. Using only a mallet, chisels, gouges and even dental picks, that outline is then brought down into the wood to various levels that I predetermined in the design stage. Literally millimeter by millimeter, the excess wood is slowly removed revealing your carving. After this roughing out phase, the design is refined removing any undesirable tool marks and smoothed with sandpaper and steel wool. Next the carving is prepared for finishing. If you desire colors, they're applied with aniline dyes. If you prefer a carving to retain it's natural wood tones, darker brown stains can be used to exaggerate the illusion of depth in the deeper portions of the carving. Upon completion the carved surface gets several coats of polyurethane varnish in a satin finish. A solid back is installed into the opening in the back of the remaining barrel to maintain the structural integrity. This is also where a heavy duty D ring hanger is securely attached to allow for wall hanging. Then the hoops are wire-brushed and the remaining barrel staves are sanded and waxed. 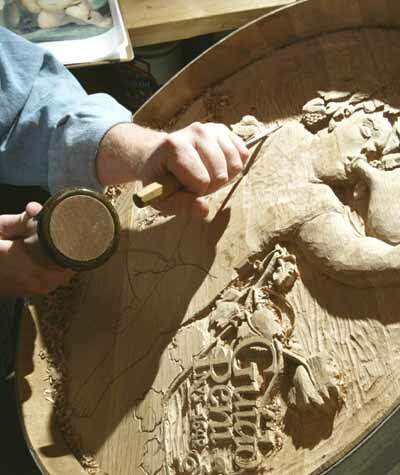 The entire carving and finishing process requires approximately two weeks, but based on my schedule I will usually ask for four to six weeks for completion.